CUBID is a large scale play /game environment in which two players collaborate in real space to move through the levels of the virtual game. The players use wireless physical interfaces to control the visuals and the sound in real time. The game is aimed at casual players of all ages. 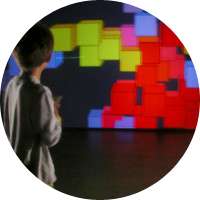 Its non- narrative content is colourful and engaging and the use of the interfaces intuitive. Because participants must collaborate to advance through the levels, and because the screen is large (3Oft) and the action is entertaining for non-participants to watch, the game has a pronounced physical and social dimension.